Whether it’s working out, jogging, or simply listening to music, good quality headphones or ear buds play a vital role in giving a pleasurable experience, I am always on a keen lookout for something that gives me quality sound without interfering with my workout routine or causing any issues while I’m jogging. The biggest concern most people have with working out while listening to music on ear buds is what happens when you sweat. And this is what has troubled me most of the times in my past experience as well. Until recently, when I was referred by a friend to try the Matone QY7 ear buds. 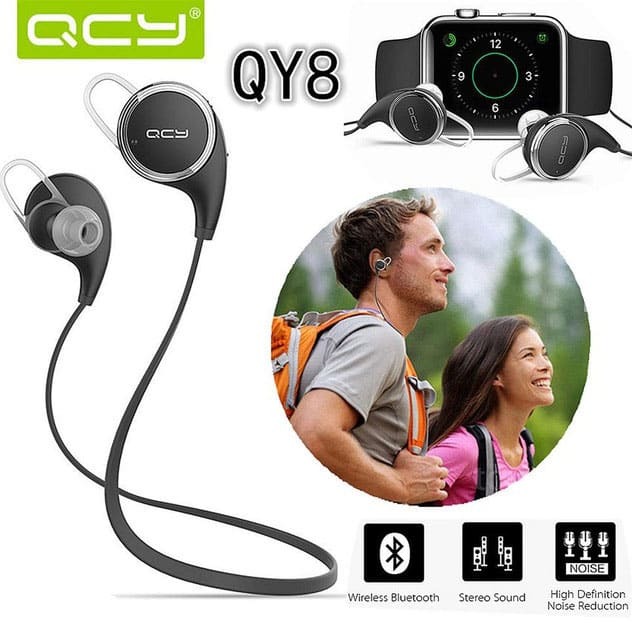 The Matone QY7 bluetooth headphones, used to be called the QY8 but they recently changed the name for reasons I can’t work out! I think it’s an upgrade to the version of the Q7. For such a low price, I did not think twice before purchasing them as the specifications clearly stated that these are wireless and sweat proof…So hey, why not. What’s the worst that can happen? I certainly wasn’t expecting to be blown away by their performance. What are they like for working out with? Most headphones or earbuds that I have used in the past have failed to remain well-adjusted in the ears when I sweat or jog. The sweat causes the earbuds to slip out. This isn’t the case with the Matone QY7 ear buds. They have an adequate resistance to sweat and the design allows these ear buds to remain in position. No matter how tough my workout is or how long I jog, these earbuds did a pretty good job of staying put. Some gym sessions just seem to drag on more than others. It seems as though every little distraction is attempting to disrupt your workout routine. Sometimes, you need to just zone out and what better way to do that, than by using noise cancelling headphones! OK, so for the bargain basement price these Matone’s cost, I’m not expecting noise cancelling like the Bose QC20’s offer as these are about 1/10th of the cost! however, if you’re going to offer it, then it has to be worthwhile. I have to say, they do a pretty stand up job. These little Matone QY7’s certainly don’t shut the world off completely – but there is a very noticeable difference. I’m a bass lover. I can’t carry those giant woofers along with me to enjoy deep bass. I’ve wasted money on lots of headphones and ear buds as none of them had the pure bass experience. They usually sound like stupid drums. The Matone Q8s offer fairly strong bass. They are not going to rock your world, but again, I have to keep pointing to the price -you are not going to get better bass in this price bracket. Although I mainly use my ear buds and headphones for listening to music, I often use them as an aid for making calls as well. In my experience with these ear buds, the voice reaches my ears just fine. Most of the ear buds that are meant for listening to music do not respond well for making calls. But I am completely satisfied with the Matone QY7s in this regard. Gadgets are supposed to be advanced and easier to use. I am pretty good with gadgets yet I had to work on managing and understanding the connectivity of Matone Q8 ear buds. The manual came in handy. Going through all that text in the manual is something I don’t like to do. So this is something where the Q8 ear buds have a bit to improve. All I had to figure out was the light system. The ear buds turn blue as soon as they are connected to a device. What I liked about the connectivity of Matone Q8 ear buds is that they have a memory that saves previously paired devices. So they automatically connect to your device and get paired as soon as you turn on the Bluetooth. Going through the features I discovered that the Matone Q8 ear buds can be connected to more than one device at a time. All other things were just great, yet I wasn’t so happy about the connectivity range. The Matone QY7 ear buds only offer a connection range of maximum 10m… As soon as I go even a step further, the connection would break and the music would stop. I personally would have preferred a longer connection range. I’m often listening to music while using my laptop. If I go all the way to the kitchen to grab a glass of water, the earbuds would get disconnected. If only they had offered a broader connection range, these earbuds would have been perfect. Like most other headphones, the Matone Qy7 also have buttons for increasing and decreasing the volume. There’s nothing special about the controls. The only slight difference is that there are bumps on each of the buttons. The button with a single bump is for volume down and the double-bump button is for increasing the volume. It pretty much suits me as I can easily control the volume using these bump readings, without having the need to actually look at what button I’m pressing. Double pressing these buttons switches the tracks. The volume up button switches to the next track and the volume down button switches to the previous track. That’s about everything that I have observed in the Matone Qy8 controls. Poor battery life of such gadgets is a huge bummer for me as I’m mostly on the go. I don’t get much time to charge my portable devices. What I liked about the Matone Q8 ear buds is that their battery lasts for almost 7 hours with continuous functioning. I charge them in the evening before getting off from work, and then they keep going until night. This is a huge plus. I’ve had a pretty hectic experience with my previous ear buds as they went low on battery just after an hour or so. I’m more than happy to have found the Matone Q8s. I find them very user-friendly as they are easy to charge as well. I simply connect them with my tablet or laptop while I’m doing my work and they get charged meanwhile. Quick charging and a long-lasting battery is a great feature of the Matone Qy7 ear buds. Ear buds can have pretty pathetic designs, trust me. I have come across such troubling ones in the past that my ears started to hurt after using those ear buds for about half an hour. But what I’ve observed in the Matone Q8s is that these earphones are not that stylish but they are definitely comfortable for the ears. My ears don’t hurt even when I’m using these for hours. It’s a good thing that the company has focused more on the comfortability and less on the stylish appearance. For this price, you shouldn’t be expecting too much of a stylish and attractive product. They look fine. Build quality is a little lacking, but you can’t have everything at this price. I hate it when I get strangled between two devices from different companies that won’t connect with each other. Apple and Samsung, for one case, have this thing that Apple won’t allow Bluetooth or other direct connectivity with any other brand devices. The Matone Q8 ear buds are thankfully compatible with almost all brands and devices. Whether it is an Apple device, and android or even a Bluetooth supported LED TV. I have tried connecting my ear buds with all these three platforms and they worked absolutely perfect. I don’t have to care for the connectivity anymore whether I have my iPhone or Galaxy Tab. I would give an overall 4 out of 5 rating to the Matone Q8 ear buds after my experience. The features are good, but not perfect. But for this price, I’m happy with what I got. . Obviously the better they get, the more expensive they would be. 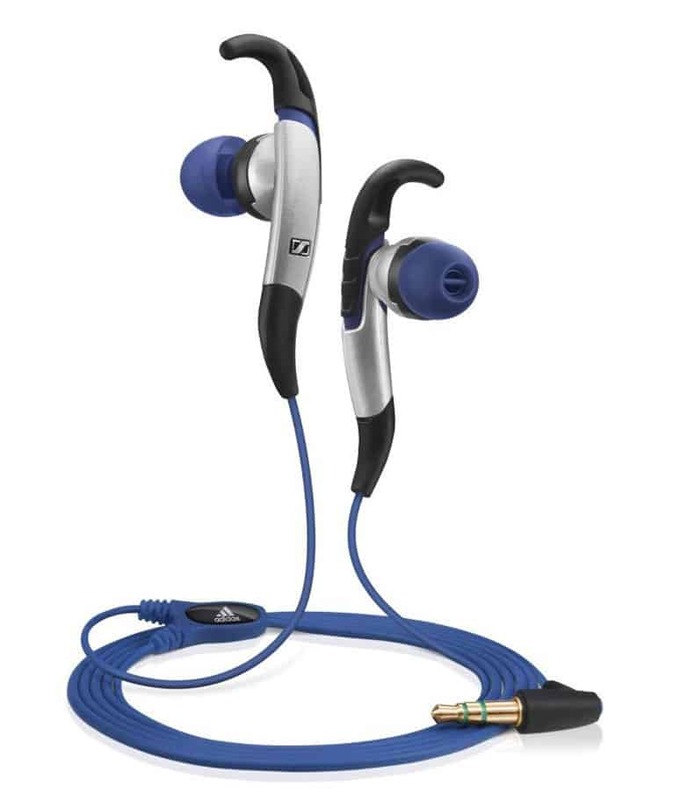 I would refer the Matone Qy7’s to anyone who is looking for inexpensive and fine earbuds, especially for gym work. For the longest time, listening to music through Bluetooth headphones was not popular with most people thanks to the poor quality of sound offered by a majority of the Bluetooth devices. However, in recent times, sound streamed via Bluetooth has improved tremendously. One device that has led to people appreciating the wireless technology is Optoma’s NuForce BE6i wireless in-ear headphones. The headphones have proven to be an affordable way of listening to good quality music. They’re well positioned price wise. Not cheap,but far from the most expensive on the market but at a level where you would expect very good quality audio and I think it’s fair to say the Nuforces provide. The good quality of music is attributable to the headphones support of the AptX codec. In addition to that, they were also made to have a balanced sound signature. This makes them great for listening to all genres of music as they have a controlled bass consequently improving the clarity of the music. The quality of sound being the main selling point of the device, the manufacturers of the device also included in the BE6i a larger 10mm driver. 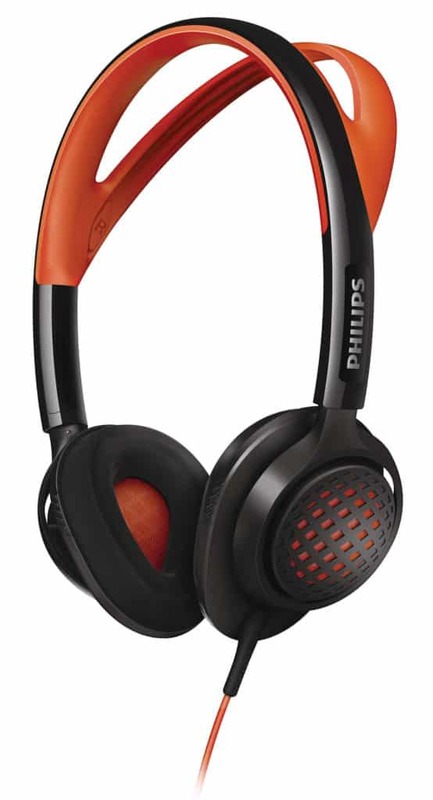 The feature ensures that sound from the headphones does not have any reverb. This is particularly useful in calls because they are often prone to echoes. The beauty of the Optoma’s NuForce BE6i wireless in-ear headphones is not only in its ability to produce good quality sound, but also in its dawning features that make them a great companion while working out. It is a recommendation for those that workout, especially joggers, to opt for accessories that are light in weight and the BE6i fits the profile. The headphones weigh approximately 0.6 ounces making them the perfect companion. As a runner, you also need not worry about getting them wet when you sweat or hit the showers. The headphones were made to be water resistant boasting of a protection rating of IPX5. They are, however, not to be exposed to dust. The X preceding the 5 in its protection rating means that the headphones do not have a certification for protection from dust. While running with headphones in their ears, the joggers worry is not only the sweat from their ears but also the probability of the headphones falling off. The constant jumping is more than likely to cause the earpieces to fall off. To counter this, the BE6i earpieces have been fitted with silicon ear wings that help keep the earpieces in place. The BE6i popularity is also attributable to its easy to understand multi-function buttons that make the gadget quite easy to operate. To lower or raise the volume all you need to do is briefly press the bottom or top buttons respectively. Long pressing these buttons gets you to the next song on the track list on the paired device. The middle button pauses or plays the music after a brief press and switches the headphones off after a long press. These multi-function buttons are located on the ribbon cable that joins the earpieces. The cable is 23 inches long and is made out of rubber. the headphones also come with Comfy foam tips and six pairs of silicone tips. The purpose of a large number of silicon tips is to increase the probability of users getting tips that fit. The comfort provided by the foam tips and having perfectly fitting silicone tips helps the user not feel any discomfort for having metal in their ears for long hours. Perhaps the most innovative feature of the BE6i is the magnetic caps at the back of its earpieces. The caps allow the user to wrap the phones around the neck while not using them as compared to putting them in the pockets or bag. The technology also reduces tangling, a characteristic of most wired earphones. The earpieces dawn an aluminum exterior. Other than making the earpieces look stylish, they also improve durability. The probability of the earpieces breaking when they fall is quite low. The durability of the headphones cut a users’ cost of repair significantly and eliminates the agony of having to buy new headphones in a short period of time. 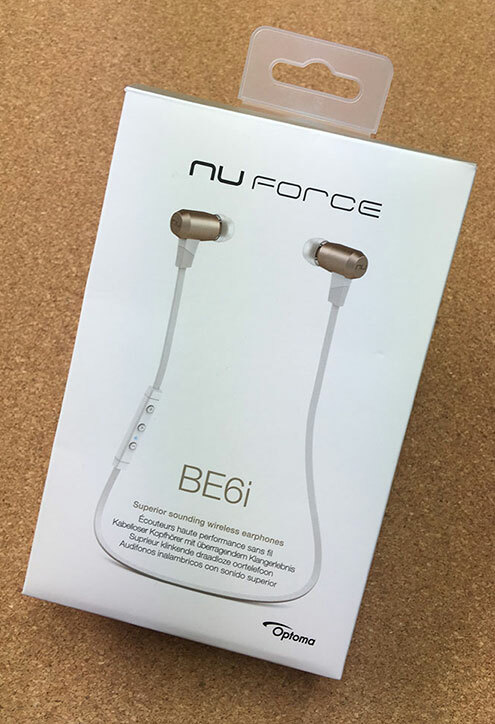 The Optoma’s NuForce BE6i wireless in-ear headphones have also been manufactured to cater for those that love controlling gadgets through remote control. They come equipped with an in-line remote which gives the user the ability to perform certain functions through it, such as skipping tracks, activating a Bluetooth pairing mode, and engaging Google Voice or Siri. This feature gives the user the feeling of being in total control of the device. As a user of the Optoma’s NuForce BE6i wireless in-ear headphones, you do not need to worry about having the headphones on all day especially if you are not close to a power source. This is because they have the ability to play music or take calls for eight consecutive hours which is generally considered above average in the world of bluetooth headphones. The biggest worry for most people that fancy Bluetooth headphones is the Bluetooth range. Their hope is that the headphones have the longest range possible to allow them to move freely without having to carry the paired device. The manufacturers of Optoma’s NuForce BE6i wireless in-ear headphones have strived to make this dream a reality by giving the BE6i’s a 100ft range, which is more than enough in practically any scenario. In testing, without any barriers between the paired device and the headphones, the sound quality remains top-notch up to a distance of 80 feet. With barriers between the two, the range reduces to about forty feet. The beauty of the device is that it will let you know, via a female voice, that the connection has been terminated once you are out of range. As you get closer to the paired device, the connection automatically re-establishes itself. The headphones are not selective regarding the type of device or brand they need to be paired with. The headphones’ only requirement is that the device that it is being paired with to have Bluetooth. This makes the headphones a good buy for anyone in the world no matter their make of their music device or phone. It is everyone’s dream not to have to keep on switching connectivity between his or her music player and phone when using Bluetooth headphones. The BE6i makes this dream come true as it allows dual device connectivity. Now a user can comfortably pair their music device and phone to one headset. This allows them to continue listening to music when they are not on that very important call. The device works by automatically stopping the play of music when a call comes in and resuming play when one is done with the call. Like any other device, the Optoma’s NuForce BE6i wireless in-ear headphones are not without their weaknesses. Perhaps their biggest downfall is their lack of a visual low battery warning. The only way for a user to know that the battery is low is through them being turned on so that the user can get to hear the warning. This calls for proper planning by the user in case they are travelling all day, and it is their obligation to ensure that they are properly charged to avoid any surprises. In addition to lacking a visual low battery warning, their other weakness is their use of the last generation Android charger. In our today world, most devices use the standard USB making the chargers available for almost everyone. The BE6i use of the USB Type-C charger makes it compulsory for a user to carry along the specific headphone’s charger since they cannot use their phone charger to charge the device. This causes a lot of inconvenience on the part of the user, especially men, as it increases the number of items one has to carry along with them. Lastly, probably a big disappointment for those that appreciate color is that the headphones do not have a vast range. They are mostly available in neutral colors with the most common being grey. Although color does not affect their performance, it surely does weigh down on its aesthetic value especially to those that do not appreciate dull colors. Upon purchase of the headphones, they come equipped with a carrying pouch, charging cable, silicon ear wings, and cord management clip. The BE6i proves to be a great purchase for the price tag. With the myriads of benefits it offers, it remains the favourite in-ear wireless headphone. 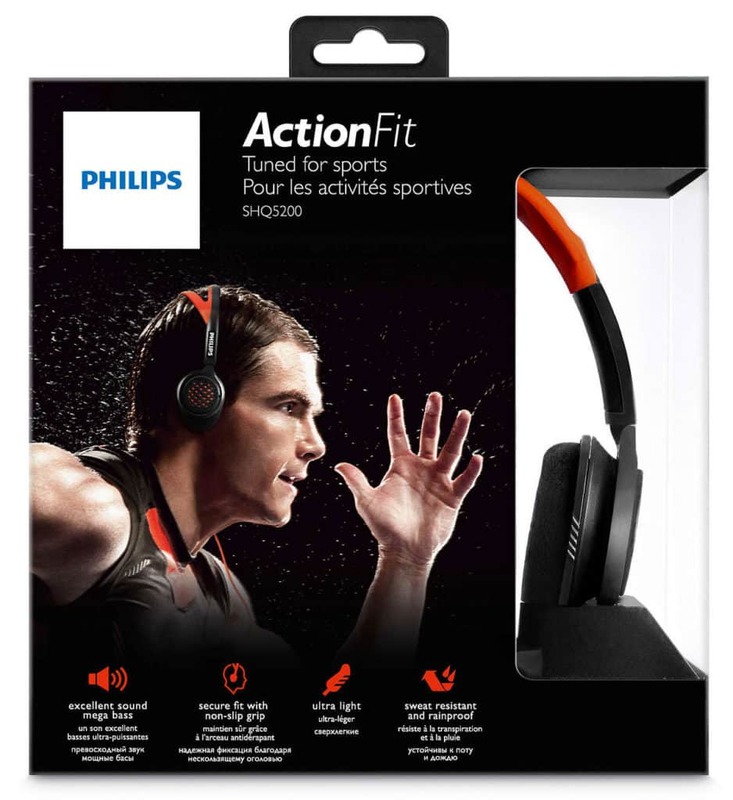 The headphones are particularly a good buy for those that love to work out thanks to the features that make it withstand all the sweating associated with workouts and those that love good clear sound. If you are in the market for a pair of in-ear headphones, you can’t go too far wrong with a pair of Optoma’s NuForce BE6i wireless in-ear headphones. Overall we were more than satisfied. So you’re in the market for a new pair of workout headphones. How about a pair specifically designed for sport? The Plantronics backbeat fit are built solely for this purpose. So you would hope the manufacturers have read our blog on what makes the perfect pair of sporty headphones! So, do they cut the mustard? Well, I’m happy to say that today we’re talking about some of the best sports headphones of the moment! So lay down and prepare to read our Plantronics Backbeat Fit review. 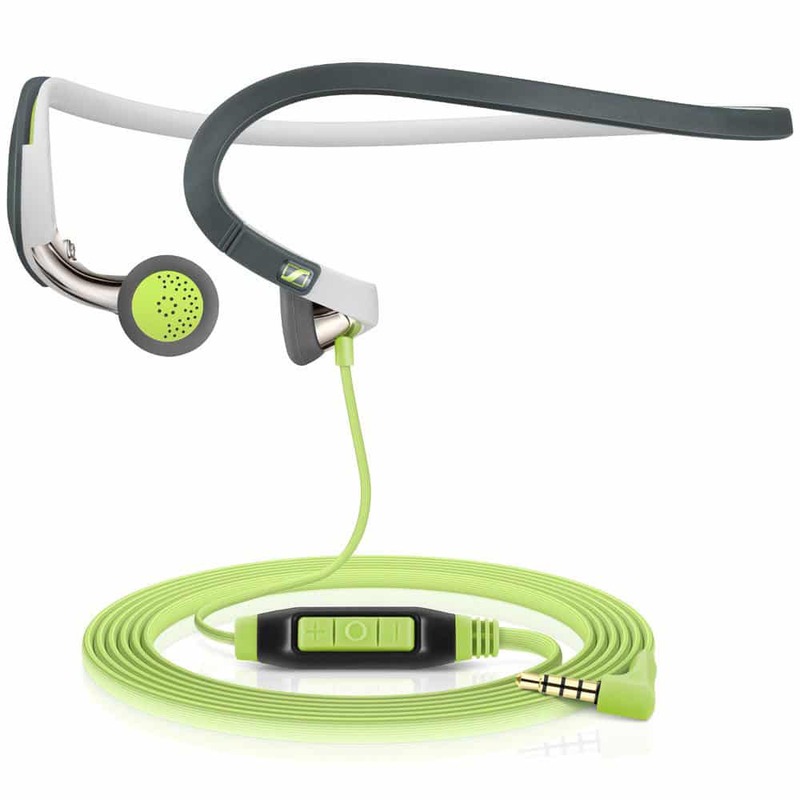 The headset was especially designed with people who need music to complete a workout in mind! Weighing less than an ounce and made of a rubberized plastic, these Plantronics wireless earbuds are also water and sweat resistant, so you’re free to make even the most extreme moves, since there’s no cable to bother you. After a first look, you will notice that they’re unsealed, so there aren’t any silicone tips to insert in your ears and completely block external noise. In our opinion, this is a big plus, since even though noise-cancelling technologies are awesome, you really need to be aware of what’s happening around you during workouts or when going for a run. Safety comes first, so it’s recommended to be able to listen for oncoming traffic! 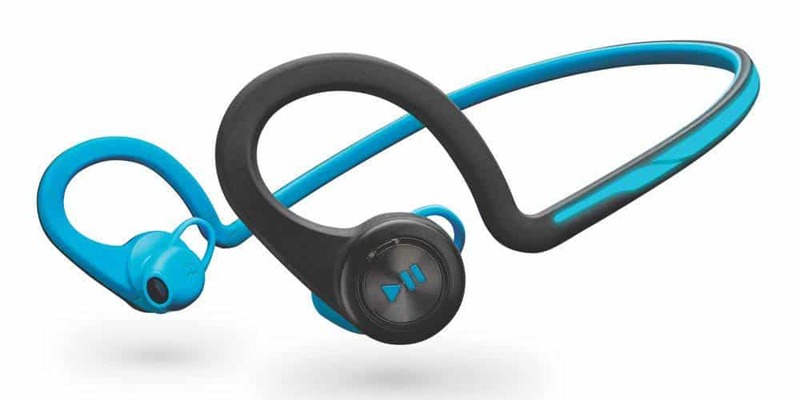 The Plantronics Backbeat Fit loop over the top of the ear and will remain secure all the time, making them suitable for running, no matter if you’re on track or treadmill. Sure, the cord that gets around your neck might bounce a bit, but you really don’t need to worry about this as they are extremely lightweight. The controls are positioned on the buds, allowing you to easily adjust the volume, change the tracks and pause the music. These are positioned on the left earpiece, while on the right you have the power and phone buttons. Also, on the same right earpiece there’s a micro USB port, that can be accessed by lifting the small cover . Oh, and yes, you do get a USB cable in the box. Like mentioned above, the Plantronics BackBeat Fit bluetooth headphones don’t have a seal, but, to our surprise, this doesn’t affect the sound quality that much. Actually, we were more than just impressed about how good they sound and how loud they can get, reaching 105 decibels. Of course, they do have their minuses. The bass is far from being strong, unlike the top of the class jaybird x2’s. However, the highs, lows and midrange…man, they sound good! In a nutshell, if you’re not an audiophile, you will barely find much to complain about the sound quality of these headphones. For a Bluetooth headset, they sound more than decent for a pair of “open” earbuds. And let’s be honest, most likely, you’re going to wear them while exercising, so you won’t pay 100% of your attention to the sound, analyzing every aspect of it, right? Let’s not forget about the wireless range, since this is also a very important aspect for a Bluetooth headset. From this point of view, the BackBeat Fit performs incredibly well, allowing you to walk up to 100 feet away from your device without the music skipping! Being a light and relatively small pair of headphones, the Plantronic BackBeat Fit are able to provide up to 8 hours of playback, at a moderate volume, which is way better than the Plantronics Backbeat Go 2. Also, when it comes to talk time, they can last up to 6 hours. Of course, the standby uptime shouldn’t be ignored either, as it can reach 14 days. Finally, the headset also has a “Deep Sleep” hibernation mode, promising up to 6 months of battery life. Yes, they have a couple of minuses, but overall, the conclusion of our Plantronics Backbeat review is that these are the best unsealed wireless Bluetooth headphones money can buy right now. With an eight-hour battery life and a really cool case, that doubles as an armband, so you can carry your phone around during workouts, they are one of the best choices an active user can make. This may not be the first review of the Jabra Move bluetooth headphones you’ve come across. They’re winning plaudits all over the web as one of the strongest contenders for the sub $100 price brand bluetooth headphones on the market today, and we have to agree. 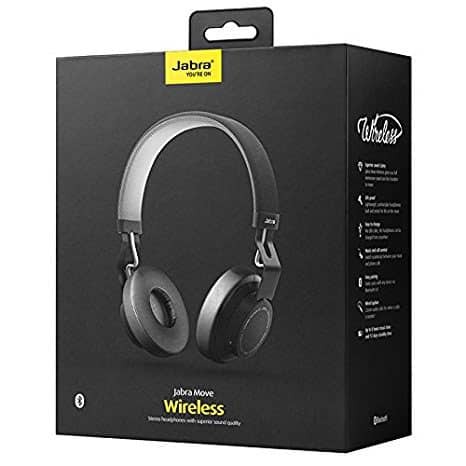 Whoever said that if you want a high-end headset you need to break the bank hasn’t heard about the Jabra Move wireless headphones. A top model, available online for a pocket-friendly price. So lets jump right into our review of the Jabra move. Of course, one of the first aspects you’ll notice about this pair of headphones is the design. It’s pretty obvious that they were designed especially for making a bold statement at the park or the gym. With a wide variety of color choices that really stand out. They have a simplistic modern look about them and from a personal point of view, I have to say I absolutely love it. They have a similar look to grado’s at a fraction of the cost. The mesh fabric covering the headband is dirt and sweat resistant, so you don’t need to worry about them becoming sticky due to your sweating, and they feel breathable and lightweight. One of the problems with wearing over ear headphones for working out, is that they can trap a lot of heat around your head – which is not exactly a pleasant experience. The majority of your heat escapes from your head when excercising – so you don’t want a heavy set pair of earphones covering most of your head, effectively stopping the heat from escaping. The Jabra move allow air to flow around your head very easily with their open design. Coupled with the breathable material mentioned before and you really have to ask if there are any better over ear phones for the gym out there right now. Moving on with the exterior, we can see even more stainless steel on the sides, as well as a flat cable on each side, going all the way into the earcups, which are coated with a matte plastic for extra stability, sporting the shape of a cone-speaker. On the bottom of the right earcup, the Jabra Move Wireless headset features a microUSB port, as well as the power/Bluetooth pairing switch, while on the left, there’s the volume rocker and the audio jack. Speaking about the rocker, it’s more complex than you can think, but we’re going to talk about it a bit later. One thing we don’t really like about these headphones is that unlike other workout over ear headphones we’ve liked, they don’t have the ability to fold. It’s only a minor hindrance though as they’re flexible enough to carry them in any bag. And they’re pretty tough too apparantly, as the manufacturer claims that they have been drop-tested thousands of times from up to 3.2 feet. So, it’s safe to say they’re pretty rugged. As they’re very lightweight, these Jabra Bluetooth headphones seemed very comfortable. The flex is strong enough to keep them attached to your head, without them getting too snug and pinching which is only benefited by the soft memory foam used on the ear pads. With a total weight of around 5.5 ounces, even after prolonged use, makes them extremely well suitable for working out for a longer periods. The thing I really liked about them was the noise cancellation. The headset doesn’t come with active noise-cancellation technology, so not up to the same capabilities as the bose QC’s, but they manage to make you completely forget about the exterior sound when the volume is turned up a little. Ok, so glowing review so far right? but lets get down to the nitty gritty. No one wants to spend around $100 on a pair of weak tinny headphones.So lets talk about the sound quality. The headset is relying on 40mm drivers and has a proprietary Digital Signal Processor which definitely helps it stand out of the crowd. It delivers clear and balanced audio, way better than you would ever expect, considering the price tag. A minor downside for those that like to listen to their headphones at max volume…if you turn them up all the way, the bass might seem overstuffed, something that it’s not that pleasant, but hey, overall, the Jabra headphones sound very good and this is a quality only usually found in much more expensive headphones. The Jabra Move can be used for calls too. We tested them on a few calls, including a couple overseas and everyone said the sound quality is really crisp, just as we felt listening to them. 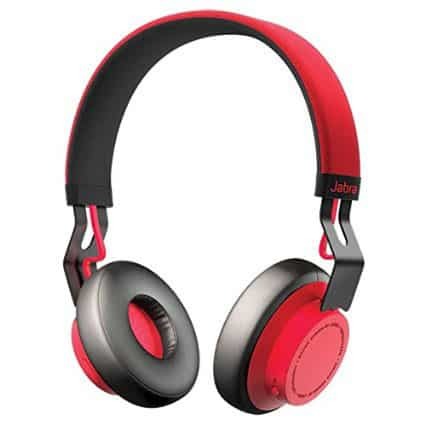 The manufacturer claims that the Move Wireless headphones are able to resist for up to 8 hours of play time or approximately 12 days of standby time. And these guys don’t lie! If you use them mostly for listening to music, it can easily reach 8 hours of battery life which for this price bracket – comes out top! The Bluetooth connectivity works very well, the headset requiring just a few seconds to pair with your devices and it was a fairly effortless procedure unlike a lot of bluetooth devices. I’m never quite sure whether to blame my phone or the device when that happens, but luckily with the jabras, that wasn’t an issue. They have a range of 25 feet before the sound starts to cut out which is a crazily long distance to be away from your phone anyway! Bottom line, we absolutely love the Jabra Move Wireless headphones. Don’t get fooled by the budget price, as these babies sound amazing, being pretty much the best value for money, no matter if you’re picking them for a retailer, Amazon, eBay, or Best Buy. For the sub $100 price, you’re getting a very good looking and light pair of headphones, able to deliver high quality audio and a more than decent battery life, of 8 hours. And let’s not forget that if you listen to music while working out, they’re an excellent addition to your gym gear! P.S. : Make sure you check out the Cobalt version, they look awesome! Whether you are hitting the pavement for a run or just working out at the gym, you will need a pair of appropriate workout earphones that don’t get in the way. When we first heard about wireless earbuds, we thought our prayers had been answered, but were sadly let down by the precursor models by their poor connectivity and lack of clarity and bass. Over the years, this technology has been steadily getting better and now, we have a few examples to recommend that are truely great headphones in their own right…wireless or not. An important aspect of fitness earphones, one that you must consider when shopping, is that they need to be sweat resistant and able to stick to the ears despite the movements and excess moisture. The Jaybird X2 headphones not only have these qualities, but as they are also cordless and very lightweight compared to some of the other bluetooth headphones out there – The X2’s come top of the class in this department as put simply, no other headphone comes close to providing the mobility while working out at the gym that these do. We were able to ascertain this after simply removing them from the box, but I think this Jaybird X2 Wireless SPORTS Earbuds review will blow you away, as it’s not just great movement that these offer. Every inch of their design is pure perfection. 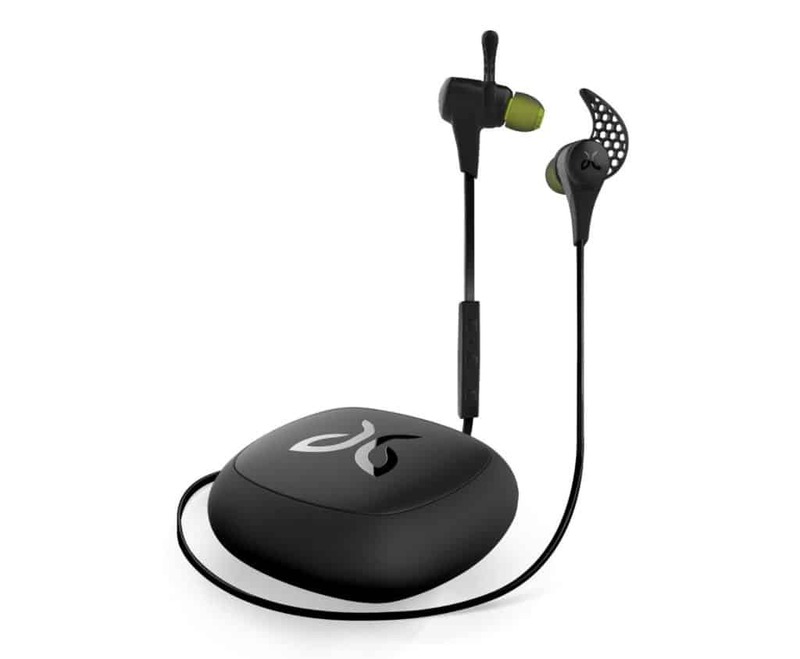 Jaybird are renowned for making some of the most popular sports-oriented Bluetooth ear buds. The Jaybird X2 earbuds are not just a typical type of earphones; they are a product of an effort by the manufacturer to deliver high quality and exceptional listening experience to the users. As compared to their predecessor, the BlueBuds X, the X2 earphones feature improved sweat resistance, improved battery life, a better mantle finish and a better carrying case. • 6mm drives with an output of 12mW RMS and a frequency response of 20-20000Hz. • 100 mAh Lithium Polymer battery, capable of supporting 8 hours of play time. Inside their packaging, the ear buds are contained in a tray. The tray holds three sets of the earbuds, featuring smart and impressive color combinations. The three ear tips are made of silicon or foam. 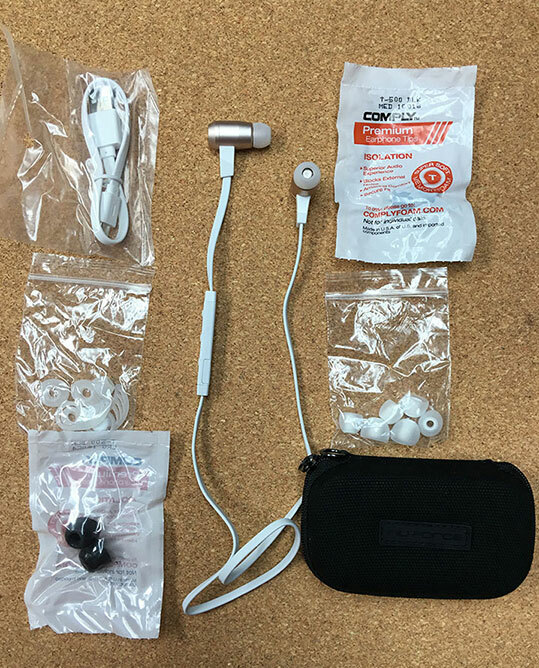 The packaging also includes a carrying case that is designed to offer additional protection to the ear tips, when they are stuffed up in a workout bag. 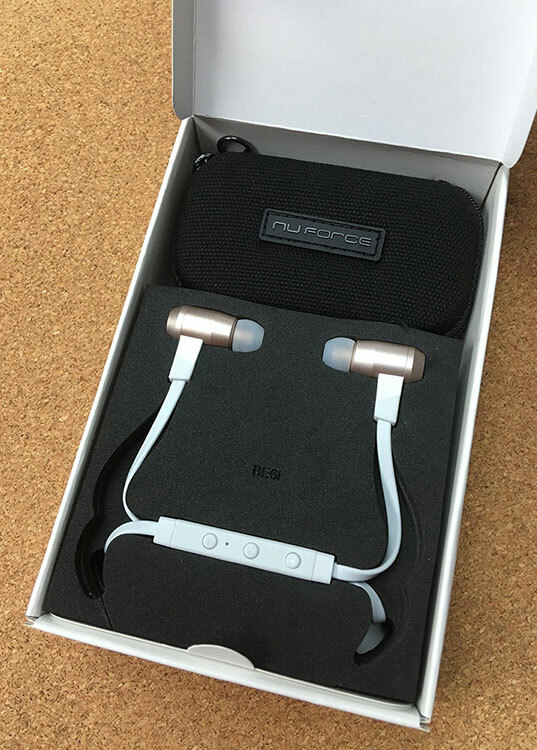 The earphones also come with three sets of ear fins — add-ons designed to hold the ear buds in place while working out, cord clips and a micro USB cable for charging the earbuds. The X2 earbuds are some of the best sounding earphones ever produced by the Jaybird manufacturer. Basically, the sound is well-balanced and delivers a decent bass performance as well as outstanding clarity. Jaybird X2 earbuds are specifically designed to deliver a bass-heavy listening experience to their users. Regardless of the genre of music you are listening to, the earphones will definitely deliver a desirable sound quality. Additionally, the ear buds make the vocals of any track stand out. Being a sound-isolating type of earbuds, the X2 creates a tight seal around your ears. This tight seal blocks out any sound from outside sources and enhances the quality of sound delivered by the ear buds. Considering the array of features offered by these ear buds, they probably are some of the best priced wireless earbuds in the market today. If you are looking for tight fitting earphones with impressive sound quality, the X2 earbuds are the fitness earphones to go for. 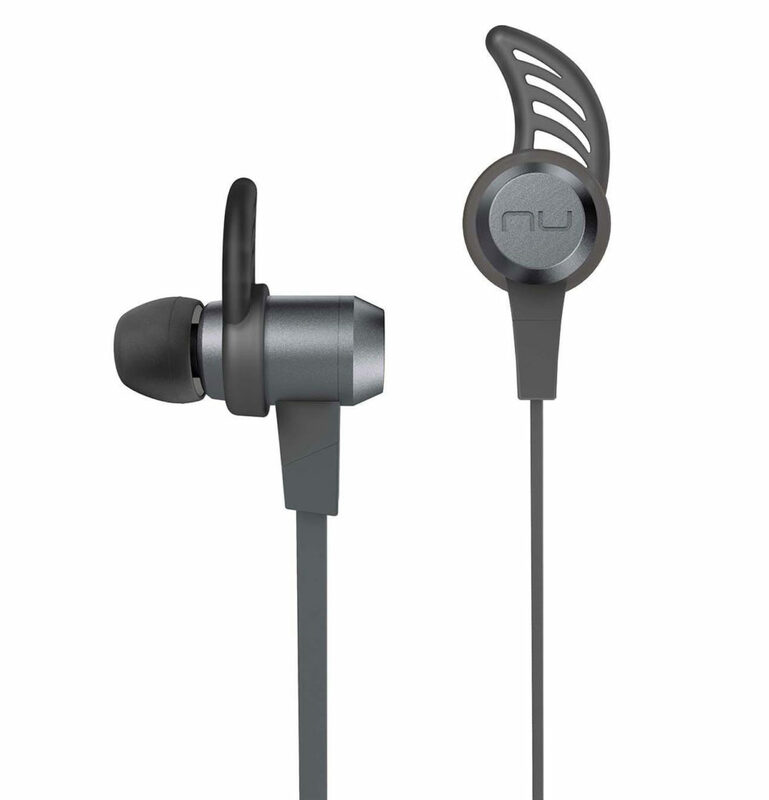 The improved battery life offered by the earbuds is also a marvel among the sports in-ear fitness earphone enthusiasts. With a choice of form or silicon ear tips, the earbuds allow the user to opt for whichever he or she finds comfortable. The ear fin add-ons may take you a while to get used to, but are very useful accessories; they are flexible and soft, designed to hold on to the ear ridges without causing any discomfort. As you can see in this Jaybird X2 Wireless SPORTS Earbuds review, these earbuds are an essential addition to your workout gear. Sennheiser Pmx 686 Headphones Review – Who Should Buy It? The Sennheiser pmx 686i is mid-range earphone that is specifically tailored towards athletes and active sport enthusiasts. The company’s effort to team-up with Adidas may prove an added attraction for gym-goers. After reviewing the model, we think that the earphone offers a good sound quality, particularly for music listeners looking for something in the price range of under hundreds of dollars. On the downside, the headphone design has limitations as it does not fit well for everyone. Opening the box reveals a subtle, thin and trendy looking bright neon green headset, with ingrained Adidas logo. The 1.2 meter cable length is suitable for most as it allows users to tuck in the headphones under their shirts. The cable also features the stand-alone control consisting of three buttons. Perhaps, the location of the controls could have been further down allowing users to retain control of the buttons during workouts. Besides, its presence close to the ears makes it inconvenient to change settings. It means that users may struggle to take control during running and jogging. The complexity increases further as a single button in the headphone accounts for multiple settings. Not everyone may feel that the location of the switch control is a problem, they will need to readjust the headband and earphones, frequently. Regarding the headband, it is provided as an extra support to sustain high-intensity workout. Still, the extra support will do little to help as numerous tests found that the earpiece are frequently dislodged during intense exercise regimen. Overall, it seems that the old-school plastic earbuds are not be a universal fit. For buyers, it also means that Sennheiser pmx 686i are mostly practical for low-intensity runs for jogging and exercise. However, when wearing in high-intensity situations, it is more practical to try it before spending those $100. If you are not going to do intense exercise or feel that it will be an acceptable fit for your head size, good sound performance at this price is a hefty bonus. Regarding sound, numerous tests reveal that the headset smoothly filters out high volume noise from trains, traffic and television. In fact, there are no visible degradation or distortion when sound is raised from low to high. Still, it does not mean that the headphone are able to cancel noise like their pricier counterparts. There will be some noise in and out of the microphone, depending on the volume and the environment. It should also be noted that people who are accustomed to very high levels of sound quality may be distracted because the sound levels does not match the pricier counterparts. Still, this is some of the best sound quality that you can get for the price. Another feature that makes these earphone stand out from the crowd is sweat-free coating. According to the company, these earphones are specifically designed to cater to excessive sweating resulting from hard exercise. It seems that the company is very confident of their claims as the accompanied literature suggests users to wash the earphones under tap water to remove sweat particles. Perhaps, the plastic design of the headsets was introduced to make it easier to apply sweat-proof and water-proof coatings. Some users have complained that the anti-bacterial coating is visible after some months of extensive workout. Although online reviews of such complaints are rare, thankfully the company also offers 2-years of warranty to deal with any issues. For most users, Sennheiser approved service centers are mostly available everywhere in and North America and Europe, which should help take care of the issue. Overall, the two models, Sennheiser 686G and Sennheiser 686i offer a descent quality headphone choice that can be used during workouts. Not as good as the similar styled Plantronic backbeat fit, as these model specifications fall short of the perfect design. As a result, users may find it difficult to keep the earbuds in place during intense workout sessions. Also, prolonged use of the earphones may induce uneasiness and discomfort. Still, the voice quality is good enough to warrant its use because additional features such as anti-bacterial sweat-proof coating and resistance of the plastic cable to water makes it a viable alternative to various pricier models. Bose QuietComfort 20 Acoustic headphones are trendsetters for a new breed of Bose equipment that particularly focuses on in-ear headphones. What makes this version of Bose QuietComfort brand different from previous offerings by the company is an impressive noise cancellation technology integrated in the tiny device. Earlier, Bose has effectively used the noise cancelling features in its best selling over-ear and on-ear headphones, Bose QC3 and QuietComfort 15, respectively. Despite different design features compared to other in-ear headphones, buyers should notice a rectangular PowerBrick down the phone jack. The PowerBrick is the battery storage unit of the device, which is not overly exposed in models such as QuietComfort 20i. However, experts agree that the PowerBrick unit was required to hold on to a powerful battery that could smoothly tackle noise cancellation in a device as small as Bose QuietComfort earbuds. In fact, the power switch is also located in this PowerBrick. Despite the somewhat oversized PowerBrick panel, only regular users of the Boss may notice it as it integrates nicely with other components of the headphone. Besides, it is also lightweight, which does not impact handling of the earphone. In addition, the textured soft-touch makes it nearly unobtrusive. Just down the chin, where the cable splits is another unit, which controls noise cancellation functions. The piece has a single control button adjacent to a side control switch that allows users to switch off the noise cancellation to hear surrounding noise. There is also a small pinhole mic, which is used for hands-free calls. The overall design of Bose QuietComfort 20 Acoustic headphones offers a light feeling despite the presence of PowerBrick and control unit. The only drawback to the design is inability of users to automatically switch between the noise-cancellation and standard modes. 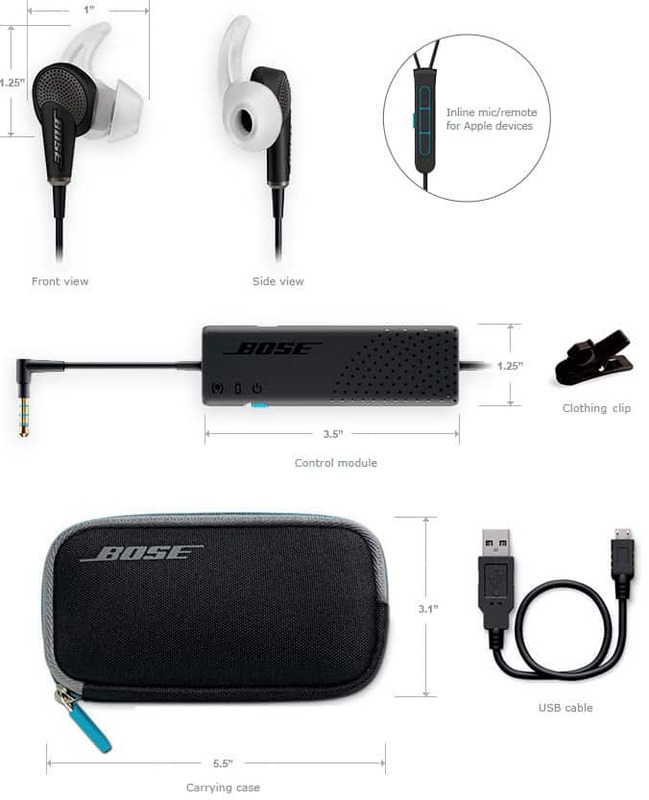 For instance, users have reported that it is easy to turn off the noise cancellation, after use. It also means that the user may get a dead battery the next time they use the earphone. Still, some will say that manual transition from standard to noise-cancellation mode is a better option. Regarding noise cancellation abilities, test clearly demonstrate that these Bose QuietComfort earbuds can easily cancel noise in the train, airports and similar areas of high intensity volume. Switching off the noise cancellation mode to standard mode allows users to hear loud sounds in the background without disrupting the music. Compared to other similar units, the noise cancellation effect is clearly evident because it can easily filter out noises in packed trains and noisy environments. However, it does not mean that the earphone will also cancel very intense sounds such as screeching of a loud train approaching the platform. In fact, users will hear the screech, but the screech does not interfere with the music even in the low volume mode. On a positive note, no one wants to suppress very high intensity sounds that often act to warn listeners of the nearby dangers. Basically, the device is made to cancel sounds such as air-condition hums and motor noise, even when it is coming from immediate vicinity. Another great feature of the product is the extended battery time, which provides almost 16 hours of listening time. For an average commuter, the battery time is sufficient to use the microphone for at least three days. As for the battery, it can be recharged using a standard microUSB port found in most smartphones. Whereas, the earphone excels in extended battery time, the battery is not replaceable. For a gadget, which is almost $300 in price, it can put off some users who need an option to replace the battery. Interestingly, the sound quality may suffer if the battery starts depleting. to the music without degrading the quality of voice, unless in high-noise environments. In addition, the extended battery time of almost 16 hours adds to the value. BAD: For most users who want to switch to a high quality in-ear headphone, the price is high. Perhaps, they are better off looking to a variety of other options in the market. Moreover, the irreplaceable battery is also a slight disappointment. The field of sports headphones is becoming increasingly crowded, so finding the best possible pair for specific activities at a reasonable price is tough. These particular headphones have a lot to recommend them, but ultimately are not likely to be the first choice for many people. Read the rest of our Sennheiser CX 685 Adidas Review to find out why. The design is probably the best thing about these headphones. There is an elongated piece of flexible plastic extending above and below the ear bud. The bottom piece of this elongated plastic connects to the cord, but the upper piece is a wing that hugs the upper curve of your ear to help secure the earphones in place while you work out. This is a tremendously good idea, one that helps makes the earbuds feel securely attached to your ear, even when doing fast, jagged movements, like running or playing basketball. The headphones also come with three sizes of inserts for the earbuds themselves, allowing you to pick the size that best fits your ears. 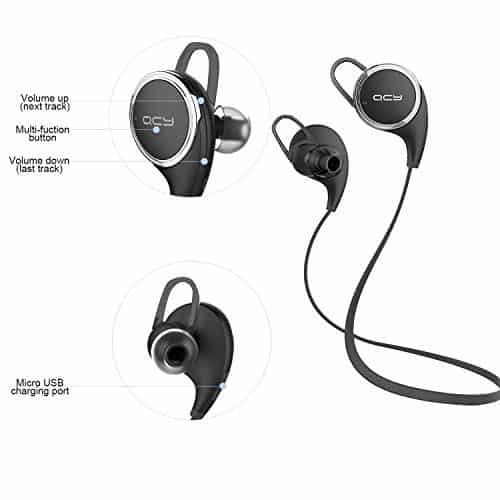 The CX685’s also seem fairly tough and durable, which is an added bonus for people who put their headphones through a lot in the course of their workout, especially those who workout outside and expose their headphones to the elements. The cords do become tangled easily, which is a real annoyance. You will have to make a definite point of carefully coiling them and storing them that way between workouts or you will lose some time each day untangling them before you can workout. The biggest design drawback, which is a significant one, is that there is no in-line remote or microphone. 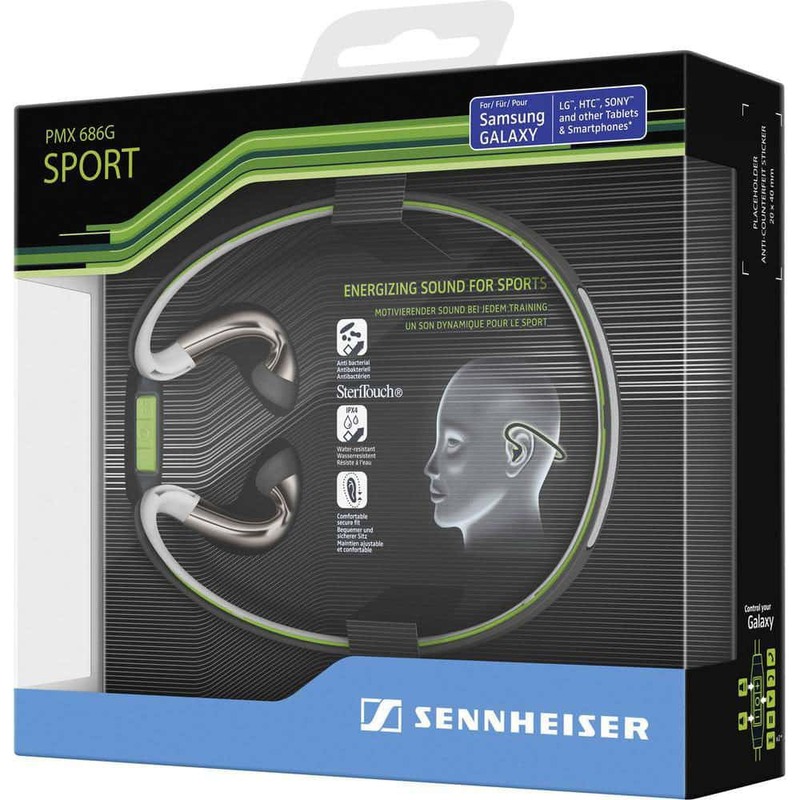 Most sports headphones now come with an in-line remote that at a very minimum allows you to adjust the volume of your music, and many include the additional ability to skip forward and backward on your music tracks and some also include a microphone and the ability to take and make calls without getting your phone out. In this environment, a set of headphones that does none of those things seems like a dinosaur. 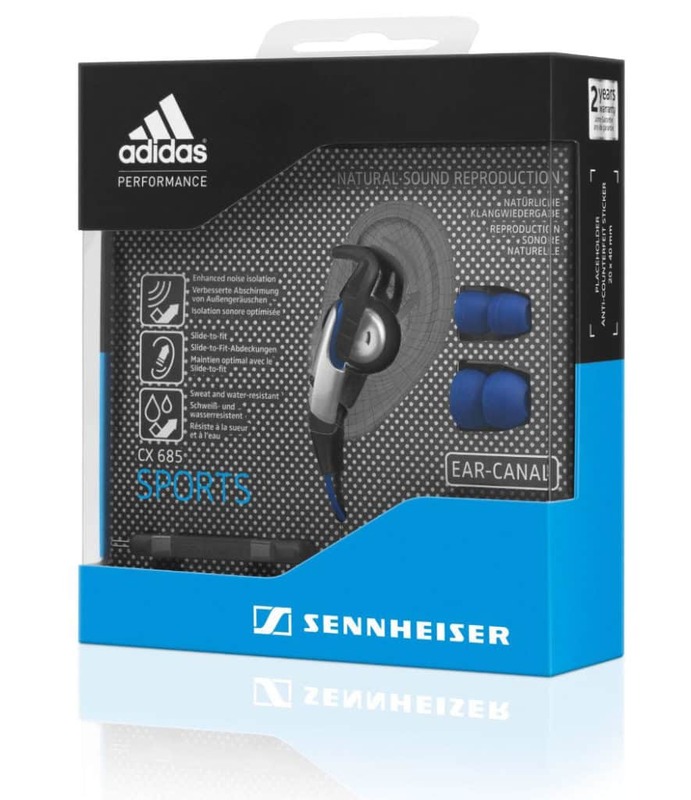 Considering that you can pick the size of your earbud insert, you would expect the Sennheiser Adidas Sports headphones to among the most comfortable of the headphones we have reviewed on this site. Unfortunately, that is not the case. After about half an hour, the earbuds become uncomfortable. Really uncomfortable. The problem, we suspect, is not the size of the earbud inserts but rather the materials used. Unlike most headphones that use a soft silicone for their earbud inserts, for some inexplicable reason the Sennheiser cx685 headphones use rigid plastic. If you expect to do shorter workouts at high intensity, this issue might not be a problem for you, but for people who spend more time in the gym, this could be an ongoing annoyance. The sound quality of these headphones is top-notch. These headphones maintain true sound until you get to the loudest audio settings. The bass sounds come through true and clear, and so do the higher pitches. You can listen to opera or Jay-Z, and both will sound as good as you can expect from an in-ear headphone. The price is another point where these headphones seem a bit like a failure. They are listed at around seventy dollars retail, which is on the high end of average for a pair of sports headphones. And indeed, you could spend that and get a less durable pair of headphones with lower quality sound. However, you could also spend that–or less than that, in some cases–for a pair of headphones with greater comfort and the in-line remote that is useful. If you just set your audio and never adjust it during your workout, these are probably a good choice for you. Similarly, if your workouts are short enough that the discomfort of the rigid plastic earbuds are not an issue for you, these are probably a good choice for you. But if you like to adjust your music’s volume and skip tracks, or if you work out for longer periods, the Sennheiser CX 685 might eventually annoy you. If that is the case then you might want to check out a more comfortable pair, like the jaybird x2’s. Bose SoundSport earbuds are the current No.1 in our favorite workout headphones of 2016 list. One might argue that Bose are certainly not cheap, but I don’t think you will find many saying that they arn’t darn good value for money. The difference in sound quality when you slip a pair of bose in your ear compared to cheaper alternatives is palpable. These Bose SoundSport In-Ear headphones are very athletic looking. With a sporty, comfortable design, specifically designed for workouts, they stay firmly placed in the ear whilst also providing excellent quality sound, as you would expect from a pair of Bose. As you can see in the photo above, they come in range of color choices and have a multicolor ribbon cord just to add to that sporty flair. With rounded C-shaped ear ‘wings’ that allow the headphones to sit loosely in your ears, as opposed to them being jammed into them uncomfortably – it really feels like they’re not even there. The cord has an inline remote, which features a volume rocker and multifunction button for pausing your music and answering calls. The Apple/iOS version with the remote has many colors available to choose from. The Android version has a more limited color selection, and the “audio only” version has the same color selection as the Andriod version. 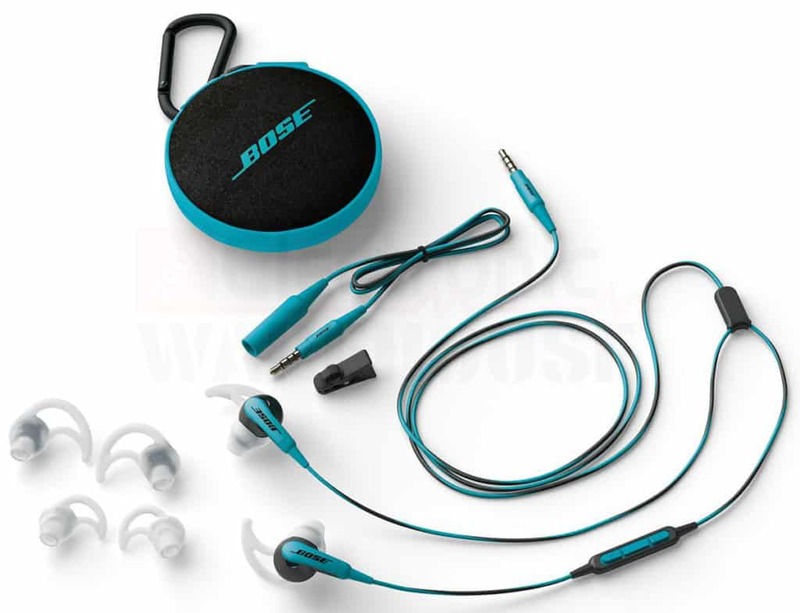 When Bose add more colors and accessories, you will find that the older colors are at a discounted price. I like the fit of the earbud because I don’t like having headphones stuck all the way in my ears. Plus, the rounded C-shaped ear ‘wings’ make it easy to have a hard workout without always needing to adjust them if they slip out. 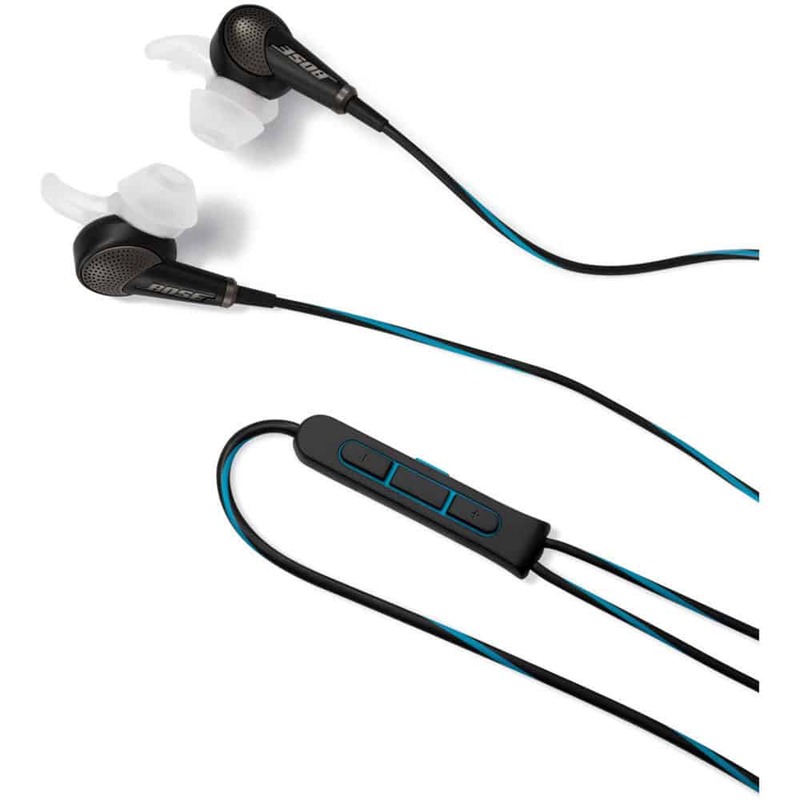 When you buy your Bose SoundSport headphones, they include three different sizes of ear tips. Keep in mind that these earbuds won’t seal your ear canal off. This means noise from the outside world will be heard, though, if you want to block noise from the gym, they are great. Along with the different sizes of ear tips, Bose also includes different sizes of wings to give you the best fit and comfort. You will also receive a round, compact carrying case. It is easily clipped to the inside of your gym bag or pocket book with an attached carabiner. These earbuds come with silicone tips – that sit in your ear canal – and have C-shaped wings, that set into the side of your ear. This will secure the earbuds, ensuring your workouts aren’t paused momentarily by having to put them back in your ear if they fall out. The audio quality is excellent – everything you’d expect from Bose – but I feel the bass could have just a tiny bit more ‘oomph.’ – but thats just nitpicking. They do have good bass, but not quite up to the level of other Bose versions. As I conclude my Bose SoundSport review, I do have to say that these headphones are very comfortable, and the sound quality is above average. What really makes these earbuds stand out as fantastic workout headphones, is that you really don’t notice they are there. Really lightweight, yet they stay put and provide well above average sound quality. Everything you would expect from a pair of gym headphones. – If you’re looking for a pair of headphones that are solely used for working out – then as things stand – these are the best around.